After the near 14-minute public apology to everyone from his wife and children to his fans and sponsors, Tiger Woods is alive and well. . .
For those of us who wanted to hear him say 'it,' I believe "The issue involved here was my repeated irresponsible behavior. I was unfaithful. I had affairs. I cheated." should satisfy us. For those of us who wanted to believe he 'gets it,' I believe " . .character and decency are what really count. Parents used to point to me as as a role model for their kids. I owe all of those families a special apology. I want to say to them that I am truly sorry." should satisfy us. For those of you who want more tabloid material, I believe "I understand the press wants to ask me for the details and the times I was unfaithful. I understand people want to know whether Elin and I will remain together. Please know that as far as I'm concerned, every one of these questions and answers is a matter between Elin and me. These are issues between a husband and a wife." should satisfy us. To be fair, Tiger really didn't need to say anything at all. For those of you who want more, those of you who want him to understand what he's done, and for those of you who needed an outright admission of guilt, move along! Tiger Woods is the greatest golfer on the planet, and spade a spade he's the greatest golfer of all time but that is where it ends. He isn't your son, your father, your husband, or your employee. You deserve nothing from him and be ashamed if you thought you did. He isn't better than you at life, just golf, a game. That is exactly where we went wrong. We put someone up on a pedestal who admittedly attempts to keep his life private from all and now, we are supposed to be stunned there is things we didn't know about him? That's our fault for thinking the cover was as good as the book, that we've never read. At some point we believed that Tiger Woods wasn't just a golfer, however that is precisely what he is. Tiger doesn't sign in legislation that impacts our lives, he doesn't teach in our schools to impact the lives of our children, he's a golfer. What we witnessed on Friday morning wasn't a Mark McGwire(esque) or Alex Rodriguez(esque) pre-written speech, it included all the things that we wanted to hear but the things an athlete wanted to say as well. Tiger addressed his foundation, of which he was contrite for letting them down and vowed to continue his good work with them. Tiger addressed his employees and his employers, who would have much rathered never heard a peep about any of this. Tiger defended his wife, slamming those of us who claimed she attacked him on the night of his accident. Tiger took it to the paparazzi, whose spineless job of chasing his infant children to school and following his distraught wife around like scum has only made their situation more difficult. However, Tiger also continued to take responsibility for his actions, recognizing he was selfish, acting like he was above normal behavior, something very few athletes and celebrities would have done. For these acts we should applaud him, as a man. Yes, I said applaud him. Tiger Woods shouldn't get our sympathy, it's inappropriate to offer it. 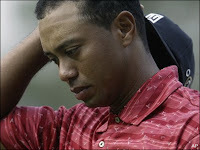 He should however get our relief, now that Tiger has opened up verbally it's about time we leave this man alone. Allow the PGA Tour to lick their own wounds, and get back to focousing on your own lives, because believe it or not, they are much more important.